Remember this from a couple months ago? It was my spatchcock chicken “one pan miracle” dinner and I have another one for you! 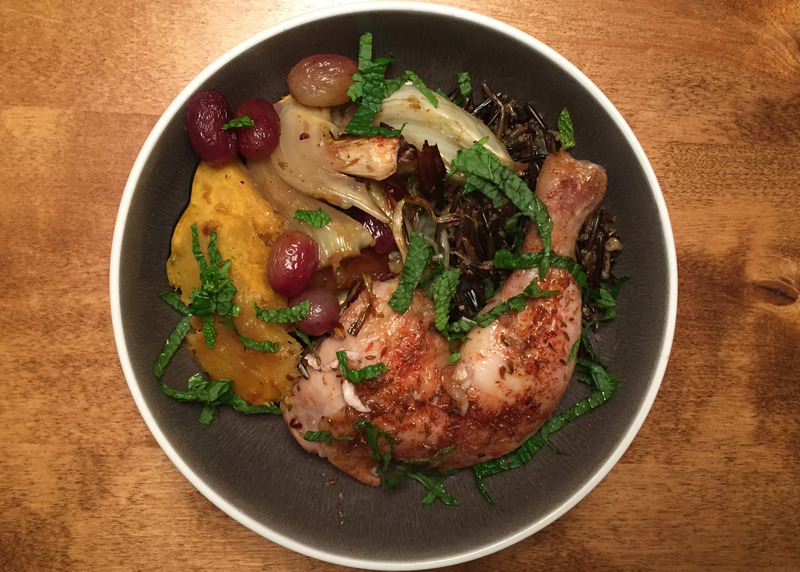 I followed the latest inspiration recipe pretty closely except I used a whole spatchcock chicken instead of just thighs (I am LOVING the spatchcock chicken) and I added leeks (how many forking leeks did I plant this year?!?!). The roasted fennel adds a lovely unique flavour and the grapes soften into little pillows of yummy-ness (technical term). 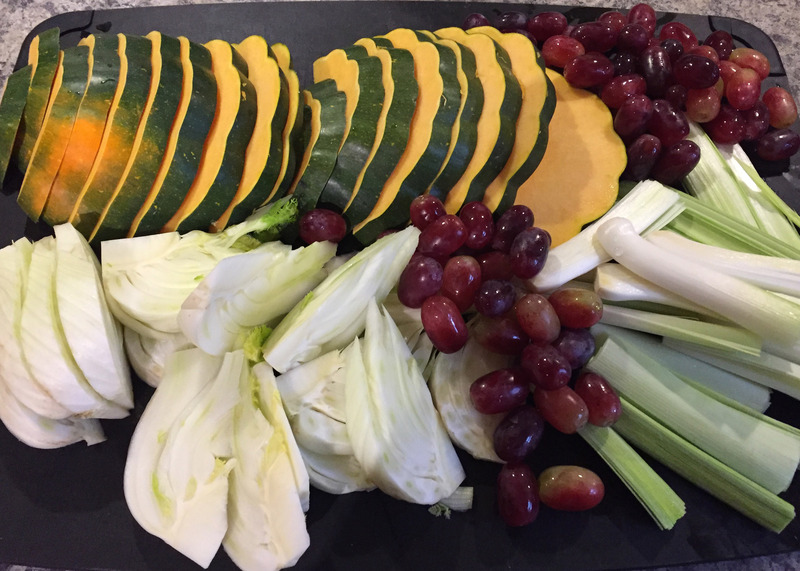 If you don’t have leeks I suggest adding wedges of onion or shallot to the veggies to balance the sweetness of the fennel and grapes. Next time I think I will also throw a teaspoon of smoked paprika into the rub to deepen the flavour just a touch. It’s important to use a pan big enough so the vegetables can be spread out in a single layer to ensure they brown and caramelize rather than just steam. I had more vegetables than I needed so into the fridge they went and the next morning I used the saved chicken bones, the wings and the excess veggies to make a chicken vegetable stock. Shazam! (Sorry, I’ve been watching too many superhero movies…). Make your rub by combining the brown sugar, cumin, salt, pepper and cayenne. Just in case you’ve forgotten how to spatchcock, place the chicken breast side down on a work surface. Starting at the thigh end, cut along one side of backbone with kitchen shears. Turn chicken around and cut along other side. Discard backbone or save for stock. Flip the chicken, open it like a book and press firmly on the breastbone to flatten (before flipping, I sometimes help the chicken breast crack by using my knife to make a cut in the thickest part of the bone). Sprinkle both sides with half your rub and refrigerate for at least an hour, or overnight. Toss vegetables with olive oil and the other half of the rub and place on a large rimmed baking sheet, arranging in a single layer. 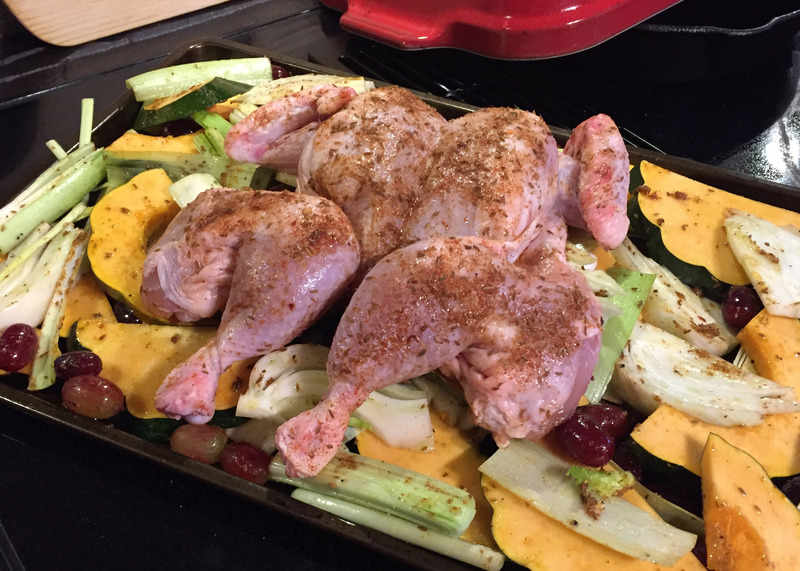 Place the chicken, skin side up, on top of the veggies and fruit and roast for 20 minutes. At this point I like to gently lift the chicken with some tongs and give the vegetables a stir to ensure they are all getting nicely browned. Return the pan to the oven for another 20-30 minutes, until the chicken is cooked through (internal temperature should be 165F). Remove chicken from oven and let rest 5-10 minutes. I like to keep the veggies warm during the resting period by turning off but leaving them in the oven. 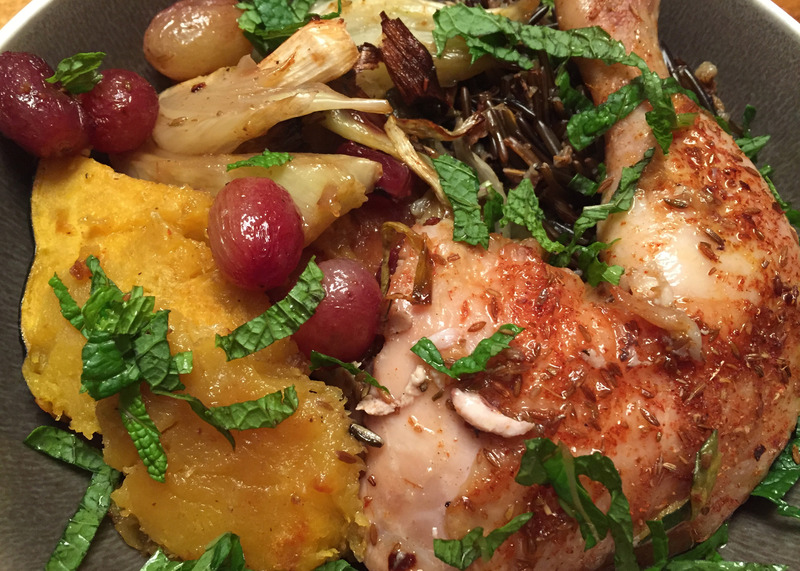 Cut up the chicken and serve family style or in individual bowls garnished with torn mint. I served this with wild rice and it was delicious.